Every month, Fulbridge interviews an ETA from around the world to get a glimpse of what life is like in different placements. 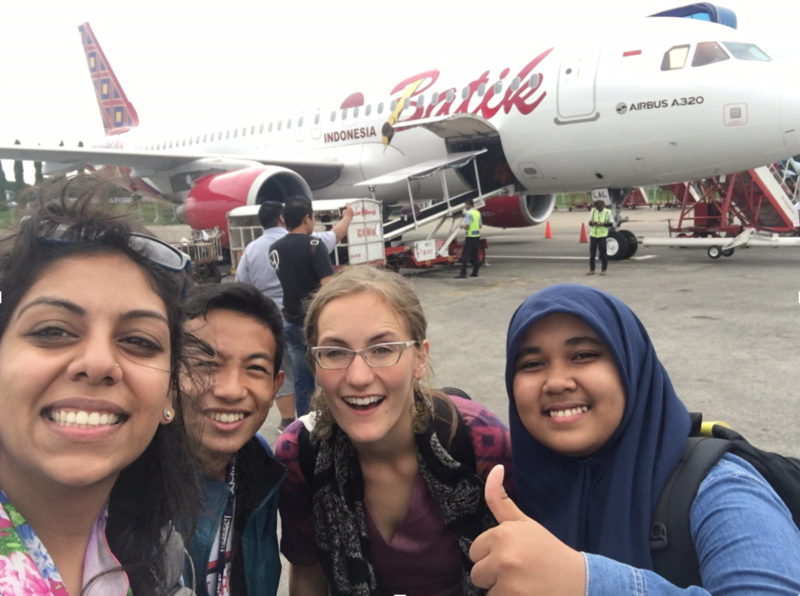 This month, Ayat Abourashed, 2016-17 ETA in Indonesia, and Lisa Gagnon, a 2017-2018 ETA in Latvia, talked with Krupa Patel, a 2016-2017 ETA in Indonesia. I love learning about Southeast Asia. I had been to most of the countries in that region except Indonesia. I thought doing a Fulbright there would be the best way to learn about the country, and I was right. Krupa and her lucu lucu gila gila siswa (funny, cute and silly students) on a camping field trip. What did a normal weekday look like for you? I woke up somewhere around 5:30am. I showered and headed to school: SMA Khadija in Surabaya, East Java, the second largest city in the country after Jakarta. My commute was a 5 minute walk around the corner from my house. I taught 2 or 3 classes in the morning then had a break for an hour. The students would pray while I caught up on grading papers then I would eat lunch with some of the teachers. Then I taught another 1 or 2 classes in the afternoon. After that, I would work on my blog and grade papers while the students did their afternoon prayers. After this, I either held a running club session or stayed after school to help students their homework, applications or other extracurriculars. Then, I would either hang out with teachers from school or my neighbors. Then I worked out (if I hadn’t already worked out in the morning). After all that, I would go home! Occasionally, I would hang out at a local cafe or mall. Also, my primary mode of transportation was motorcycle taxi – low key, I know. How did you get more involved with the school/university outside of the classroom? How did you get involved with the community? My sitemate Kelly and I presented at the American Corner at Airlangga University, Adi Buana University and the US Consulate in Surabaya. We attended events in the local community like Darmo Car Free Day, local concerts and local festivals. One time, we even went to the vegetarian expo in Surabaya and met some people who ended up becoming our closest friends there! We also made random friends wherever we went. Krupa, her sitemate Kelly, and their two students Tyo and Inaya at the airport in Jakarta, about to fly back to Surabaya after the National WORDS competition. What were some challenges you encountered as an ETA? There were a few, but nothing I didn’t eventually learn to live with. I’d also never been away from my family, or even my home state of New Jersey, for this long. I missed my family and friends! 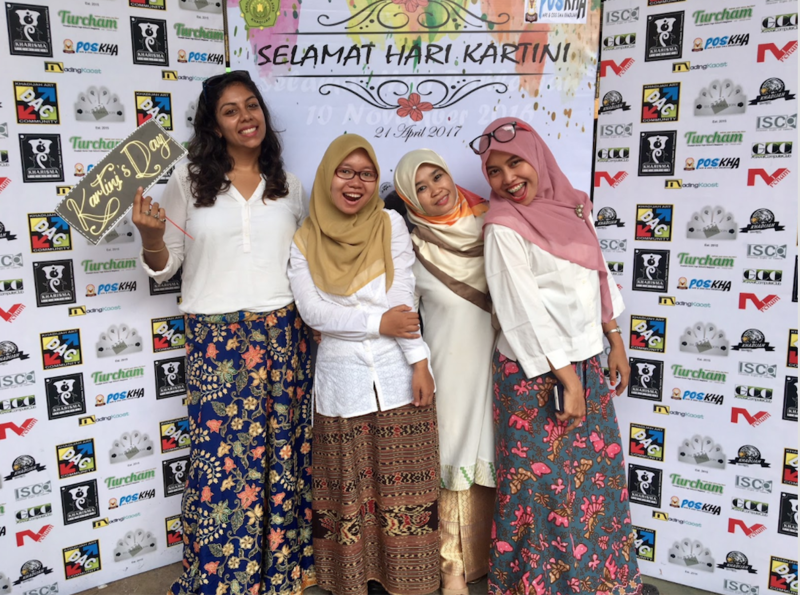 But I got to make tons of friends on my adventures in Surabaya and around the country because the people I met were so friendly. The language barrier was tough in the beginning but eventually I learned more of the language. I was comfortable enough to use it to get by. Finally, it was difficult navigating cultural norms. Growing up on the East Coast – especially so close to New York – the way I’d experienced life was “fast paced.” On the East Coast, things move quickly, and everyone is busy all the time. Things are done on a certain timeline without too many deviations. In Indonesia, people didn’t seem like they were in a rush. People were more lax about the way things flowed. My students weren’t in a rush to grow up. My co-workers weren’t in a rush to get home or get to class. This was an interesting way to experience life. At times, however, it could be frustrating – especially when you think something will be done in a week – but then 2 months go by, and it’s still not done! Oh, so many! Indonesia is a beautiful country filled with beautiful people. My highlights came from the people I met, the experiences I had and the laughs I shared. My co-teachers and I would always have a fun time at school during lunch or after school. They were such great people, funny and laid back! I also really enjoyed getting to know my students in and outside of class. One thing that sticks out to me about my time in Indonesia is a letter exchange I facilitated between 400 of my students in Indonesia and American students from my high school in the U.S. My former English teachers helped me organize this. I made each of my students write 2-4 drafts before we sent the letters off. My Indonesian students were intimidated because most had never written a letter before and the thought of a native English speaker reading their work was scary. I sat down with each of those students multiple times. Through these letters, we practiced English letter writing, and I got to know them one-on-one. Not all students spoke in class, and many were shy. But in these letters, I learned about their teenage lives, dreams, talents and passions. I’m incredibly proud of them for writing those letters. When we received the letters back from the students in the U.S., my students were so excited! I’ve never seen them like that. They were ecstatic and sharing information about their penpals with their friends. I had students who had never spoken one word to me in class come up to me and ask me how they could contact their penpal again. My heart was about to explode with joy. 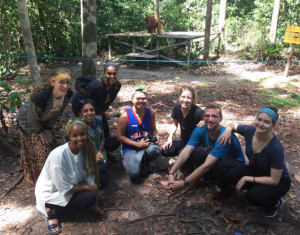 The passion from this project came from my desire to create a cultural exchange between students from different ethnicities, religions and more. These letters really started conversations! Krupa visited Padar Island near Labuan Bajo, NTT during one of her trips. Another highlight was the Beautiful Juga community engagement project my sitemate Kelly and I presented at the American Corner at Airlangga University, Adi Buana University and the US Consulate in Surabaya to over 400 people. We focused on Indonesian and American beauty standards, why they exist, their colonial legacies and the importance of feeling comfortable in your own skin. This was one of the most fulfilling things I’ve ever done. Encouraging conversation about beauty really got the audiences to think critically about this topic and self perception. Also, my boyfriend at the time came to visit me in December 2016. It was the end of the semester so we traveled around for a little over a week together. As we were climbing a small mountain on Gili Trawagan, which is a small island off the coast of Lombok, he proposed, and we’re getting married in a few months. 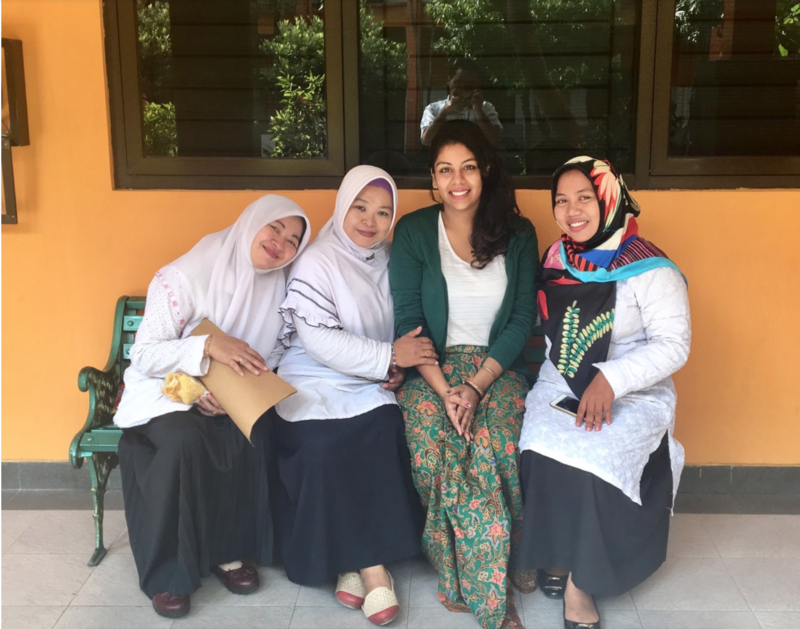 Why should prospective grantees apply to work in Indonesia? 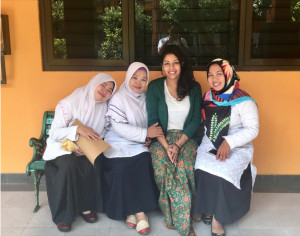 Prospective grantees should apply to Indonesia because it’s an amazing country filled with great people. There are so many cultures, ethnic groups, foods, and lifestyles to learn about. 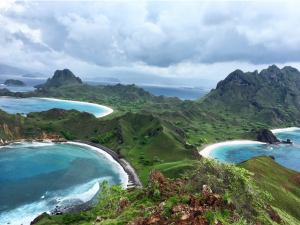 There’s more to Indonesia than just Bali, and I really hope that people get to experience the diversity of Indonesia. Not every day in Indonesia is going to be easy, but in the end, the good experiences outweigh the bad ones. You’ll leave with memories for a lifetime like I did. I can’t wait to go back! Krupa and her ibu-ibu, or “Boos,” at the Kartini Day celebration at her school. Kartini was a woman who fought for women’s rights to education. She is celebrated as a national hero. I currently work for a technology startup in NYC. So if there are any Fulbrighters in NYC, let’s meet up! How did Fulbright and being an ETA impact your career goals and future plans? 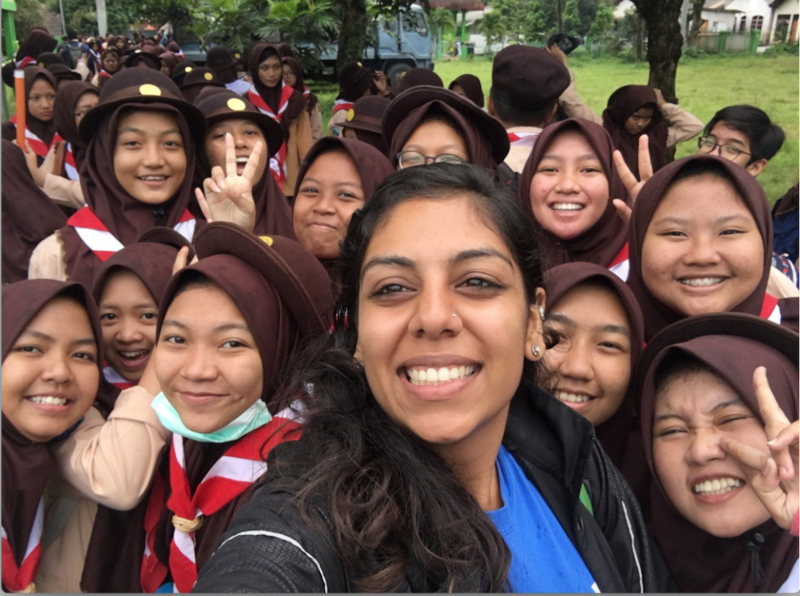 Fulbright gave me the opportunity to be on the ground in Indonesia to teach and empower. Education and empowerment are both things I have always been passionate about. As an ETA, I felt like I was making a tangible difference in my students’ lives, and helping shape their paths. I’ve always wanted to help people. I’ve been so lucky to receive a great education, and I want to share that with others. Further down the line, I want to create nonprofits and education technology companies that allow for easier access to good education system for women and children around the world. The people. I miss my students, my co-teachers, my neighbors, and friends in Indonesia. I miss causing trouble with my sitemate, Kelly, around Surabaya. I miss using motorcycle taxis, haggling at the markets, buying fried snacks on the road, and even the routine I had in Indonesia. Do you have any tips/advice for ETAs they should follow post-grant? How did you discern what you wanted to do post-grant, and what recommendations do you have for current ETAs in this regard? Go travel! I had an idea of what I wanted to do post grant workwise. I didn’t find my job until a few months after I got back to the States. I did stress a bit about not having a job lined up and tried sending my resume out and interviewing while I was in Indonesia. For me, it honestly wasn’t worth it. It got in my way of enjoying my limited time in Indonesia. Unless you’re applying to graduate school or a specific program with a deadline, I’d say slow down and worry about applying to things after you get back stateside. You will find something. 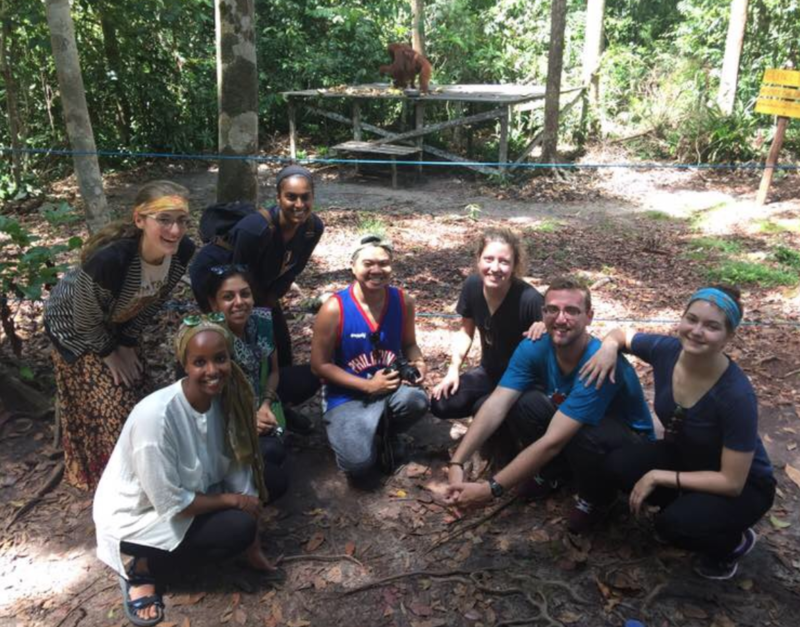 Krupa and a few other ETAs visited the orangutans Kalimantan. The term orangutan comes from Malay. “Orang” meaning “people” and “hutan” meaning forest. The literal translation means “people of the forest”. 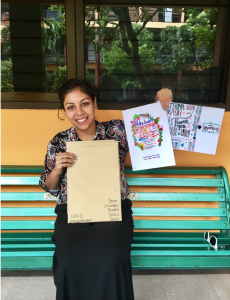 To learn more about Krupa’s grant year, check out her blog.